Paddy Fisher (left) and Nate Hall celebrate a fumble recovery against Illinois last year. The Wildcats will look for more big plays against the Fighting Illini in Saturday’s rivalry. Northwestern’s seniors have a rare opportunity. On Saturday’s Senior Day, the class will have a chance to go 4-0 against rival Illinois, which has struggled under coach Lovie Smith since he took over in 2016. The Fighting Illini — who hold a 55-51-5 edge in the all-time rivalry between the two schools — are coming off a particularly devastating 63-0 loss to Iowa, who fell to NU a week prior. Illinois (4-7, 2-6 Big Ten) hadn’t lost a game by a wider margin since at least 1905. Still, senior quarterback Clayton Thorson said the rivalry transcends any records. Besides the Land of Lincoln trophy, the Wildcats (7-4, 7-1 Big Ten) don’t have all that much to play for. They clinched a berth in the Big Ten Championship Game at Iowa on Nov. 10, and will play either Michigan or Ohio State, who will duel it out in “The Game” earlier on Saturday. On the other side, the Fighting Illini would like nothing more than to spoil NU’s Senior Day and bring the hat back to Champaign for the first time since 2014. With seven losses, they have no shot at bowl eligibility. Yet coach Pat Fitzgerald echoed Thorson’s comments about “throwing out the records” in a rivalry game. The game will also present an opportunity for Thorson to get the NU passing attack back on track. The senior gunslinger threw for 230 yards in Minneapolis, but had struggled throughout the middle of the season. His last 200-yard game before Saturday had come Oct. 13, when he threw for a career-high 455 yards in an overtime win over Nebraska. Last season, the Cats travelled to Champaign looking to extend a six-game win streak by beating a struggling Fighting Illini squad. 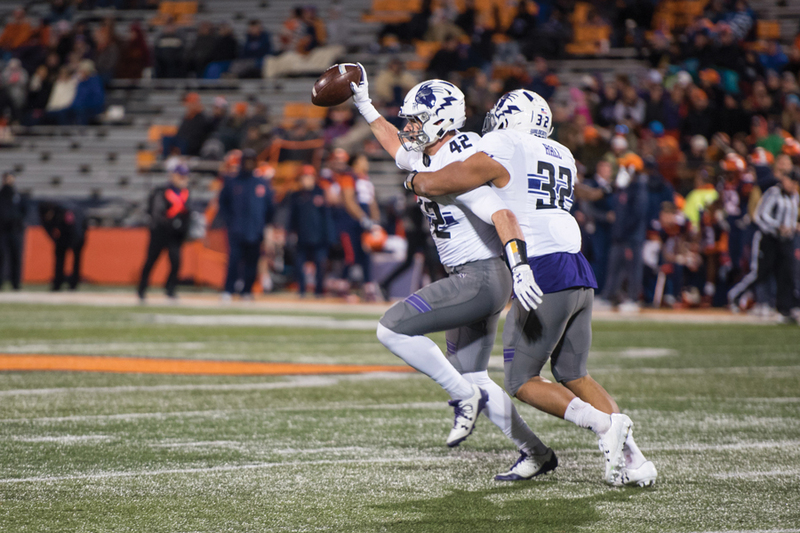 They did just that, heading home with a dominating 42-7 victory, and then-senior running back Justin Jackson had lots to say about the Illinois team. Asked about the Fighting Illini’s trash talk this week, Thorson took a more tempered tone.